What side of bow does the arrow go on? What side does the arrow go on your bow if you are right handed? Comments for What side of bow does the arrow go on? Historically the arrow has been drawn on the inside of the bow. This would be the right hand side for a right handed archer. This style is depicted in many old paintings. 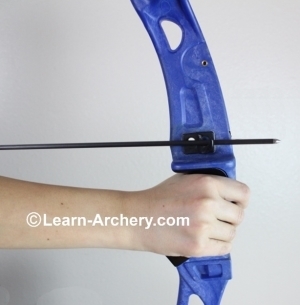 This allows the archer to quickly nock and fire an arrow without having to first flip the arrow over the bow and then let go to correctly nock the arrow on the string. Modern western style the arrow rest is located on the outside of the bow, a more relaxed style for stationary shooters. This technique is wrong. Currently in modern times if you're right handed the arrow goes on the left side or as you've shown. 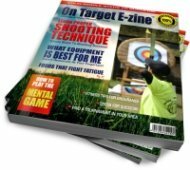 Have you ever tried shooting fast that way? The arrow is truly supposed to be placed on the same side you shoot with. If you're right handed then right side. Not only can you shoot consecutive arrows faster but more accurate as well. Western archery does it as described in the previous comment - Arrow is on the outside of the bow. That is usually combined with the Mediterranean grip or in case of a compound, with a release. Others put the arrow on the inside. This is usually combined with the Mongolian grip: You pull the string with the thumb, usually with the help of a thumb ring. The advantage of this is that you can hold multiple arrows in the hand that is drawing the string and nock and shoot extremely fast - more than one arrow / sec. Also, with this style of shooting, you shoot instinctively - without the help of visors or peeps. 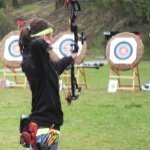 If you are right handed you should be drawing the bowstring with your right hand and holding the riser/bow in your left hand. The arrow is placed on the arrow rest so it is between the archer and the bow. Join in and write your own page! It's easy to do. How? Simply click here to return to S2-02 Nocking the Arrow.